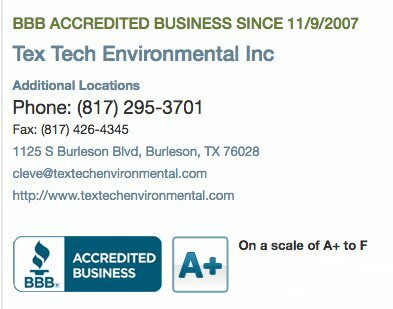 A+ Rating with BBB for Sewage Treatment | Tex Tech Environmental, Inc.
Tex Tech Environmental, Inc., a leading residential aerobic septic system provider in Johnson Co., TX is an accredited business with an A+ rating from the BBB. We have been accredited since 2007 and have maintained an A+ rating, their highest rating, ever since. You can view our rating on the BBB website under Sewage Treatment Equipment.